Book Distribution Climbs 34.5% in 1975. 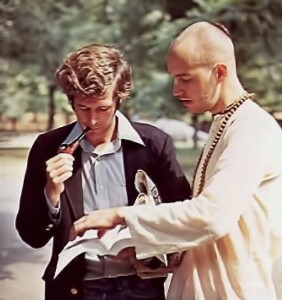 Defying the serious recession that slowed the world economy in 1975, ISKCON devotees increased their sale of Krishna conscious literature last year by more than one third over 1974. The grand total topped nine million books and magazines, not including the Spanish, German, French, and Japanese literature sold abroad. Of two million books distributed, over a half million were fully illustrated 300-400 page volumes, and the seven million BACK TO GODHEAD magazines almost doubled the previous year’s total. Why the vast increase? 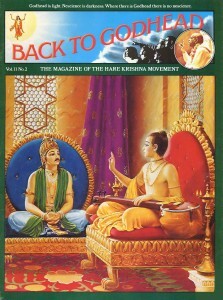 “It’s all due to the dedication of the devotees as well as a growing receptivity of the public to Krishna consciousness,” explained Ramesvara dasa, a trustee of the Bhaktivedanta Book Trust, which publishes the books of His Divine Grace A.C. Bhaktivedanta Swami Prabhupada and BACK TO GODHEAD magazine. With renewed commitment to fulfill Srila Prabhupada’s request to “distribute my books profusely,” the members of ISKCON spent more time and energy than ever before doing just that. In the process they showed impressive determination and steadfast faith. For example, the hundred-man Radha-Damodara traveling party crisscrossed North America in six new Greyhound-type buses and ten vans, breaking sales records and simultaneously putting on full-scale lecture and festival programs on dozens of campuses. To accommodate expanding book distribution and festival programs, the International Society for Krishna Consciousness is busily acquiring new preaching bases in major American cities. The new Detroit temple is a Spanish-mission style stucco and marble mansion that originally housed the wealthy Lawrence B. Fisher, of “body by Fisher” fame, when he was the first president of Cadillac Motors in 1929. Replete with formal gardens, fountains, and even a waterfall, the estate lies on the Detroit River and features an ornate boathouse with indoor boat well. The temple was purchased with donations from local supporters and others sympathetic to the cause of Krishna consciousness. In Maryland, ISKCON devotees have recently purchased a striking fifteen-acre estate within an easy half-hour’s drive from Washington, D. C. Constructed a few years ago as a day camp and riding stable, the estate sports a gymnasium, barn, and swimming pool. Residents of Potomac, the affluent suburb that surrounds the estate, will greet the devotees on March 1st, 1976, the official opening date. Plans for the estate reveal that it will be a thriving center for Krishna consciousness. One of its functions will be to serve as a base for groups of devotees to regularly tour the Washington area, chanting Hare Krishna and distributing literature. In addition, the gymnasium on the property will be converted into a temple for worshiping the Deities of Radha and Krishna. In a kitchen designed to meet rigorous government health code standards, devotees will prepare elaborate prasada feasts for hundreds. And by developing the guesthouse facilities (including a swimming pool), the devotees hope to attract members of Washington’s diplomatic circles, among others, for Sunday festivals and life membership programs.